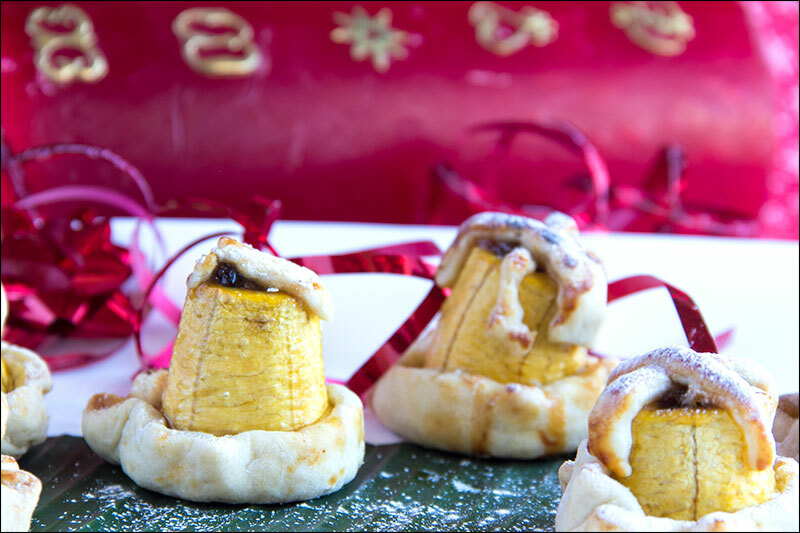 A tropical alternative to traditional mince pies! Preheat oven to 200oC/fan 180oC/390oF/gas 6. Peel then slice the plantain into 4 pieces crosswise to make 4 equal cylindrical lengths. Stand the plantain pieces upright on a chopping board and use an apple corer to hollow out the centres. Roll the pastry flat on a floured surface and cut out 4 circles about 8 cm (3 inches) in diameter. Sit the plantain pieces upright on the centre of each circle of pastry. Fill the hollow centres with mincemeat pushing it in with the end of a teaspoon. Brush the pastry edges with egg, gather up the sides and pinch together to hug the plantain. Cut the remaining pastry into strips or shapes, lay across the top and brush with the egg. Bake in the oven for 20-25 minutes or until the plantain and pastry are cooked and golden. Serve with a sprinkling of icing sugar or as little islands in a sea of custard. I bake the plantain cores at the same time as the tarts and have them as a cook’s treat, dipped in something sinful. No Replies to "Patti's Plantain Mince Pies"